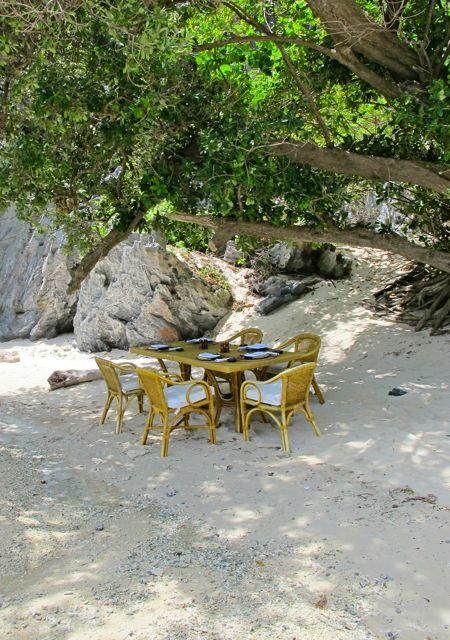 The setting was a table set under the cooling shade of a large tree. Our feet were on the sand, and as the gentle waves hit shore, you could feel the water between your toes if you were on one side of the table. Placemats, cutlery, linen, china and glasses were set, along with a table centerpiece as well! You couldn’t ask for a more spectacular view than this. Of course our two guests got the best seats at the table. It was not only their first time to Asia and the Philippines, it was their first time to have a sit-down meal literally on the beach! 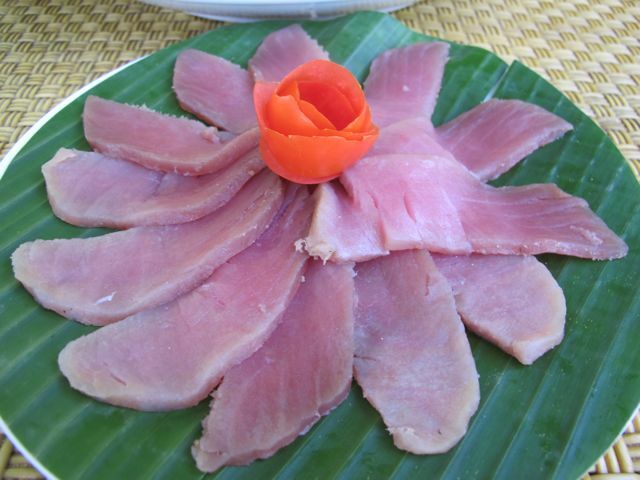 We started with some cured or smoked fish, probably tuna, served with lemon honey mustard sauce. I thought they were slices of sashimi gone bad when they first arrived, but their color was actually a result of the smoking and curing. Delicious. This was followed by an utterly superb shrimp kinilaw or ceviche. Unlike the fish kinilaw that we make at home, where the vinegar just barely has time to kiss the fish, this one had been marinating for a while, and the shrimp was “cooked” all the way through. It was the first time I have had shrimp kinilaw and I thought it was absolutely brilliant. Will have to try my hand at making this, but it was just really addictive. The texture of the shrimp was a little rubbery in a nice kind of way, and the balance of sourness and saltiness in the marinade had Mrs. MM and I taking some of the marinade to add to some of the grilled items that appeared later… a really nice unexpected sawsawan or sauce! 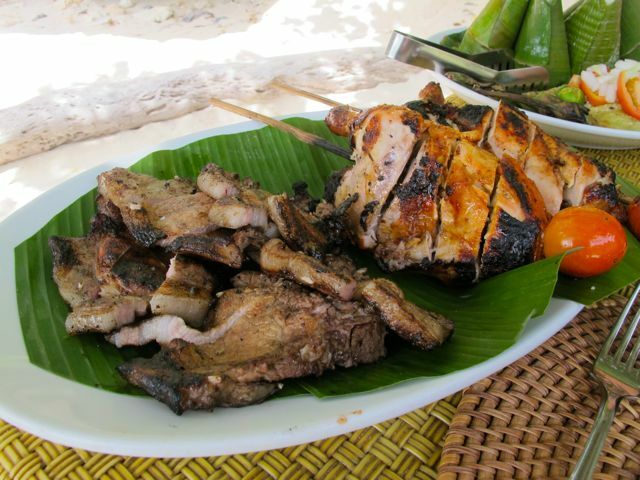 …next appeared some inihaw na pork chops, done just a few meters away on a portable grill, as well as some grilled chicken inasal. 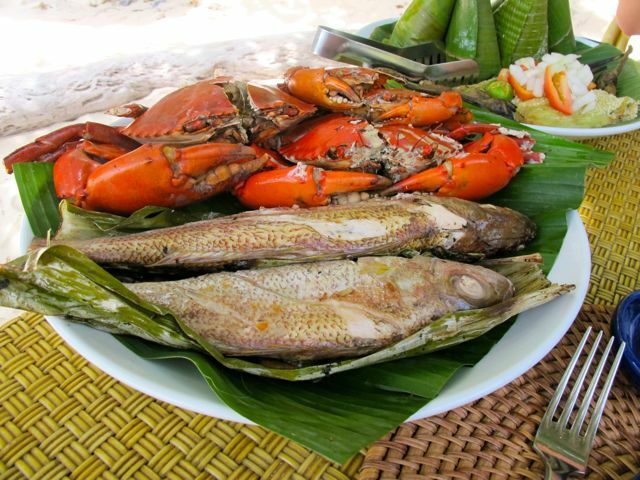 Just when you thought you would burst at the seams, a platter of alimango or mud crabs, and several grilled fish was presented by the waitstaff! 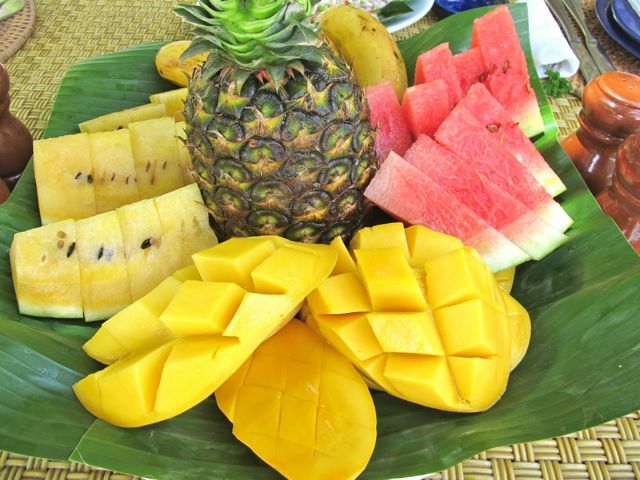 A refreshing fruit platter had watermelon, mangoes, bananas and pineapples. A cooler with water and sodas kept us hydrated throughout or stay on the beach. MM, and now i’m wondering how much it would cost for a party of 12…just to experience what you have just done. Simple & Exclusive! Thanks for sharing. On a side note, good thing they did not slice your kryptonite, the pineapple! 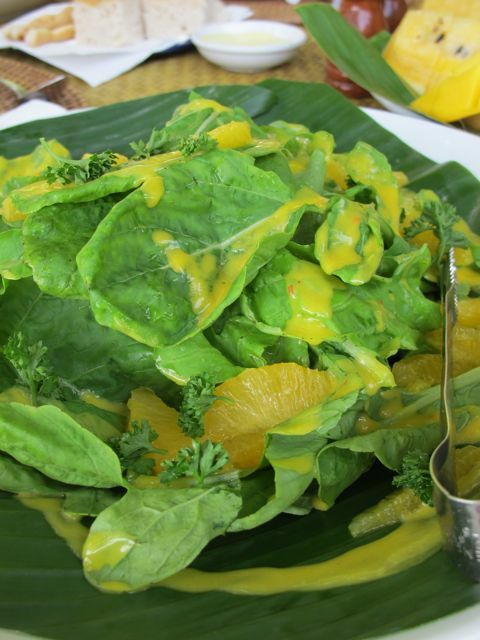 The food is so mouth watering and the photos are fantastic! Oh the food! La dolce vita. This is picnic??? I think it’s a buffet lunch in some 5 star hotel!! It’s an awesome spread with a more awesome background, MM! Your guests are sure to be sated after. I still keep on looking for “buro” and remembering that it didn’t “grow” on you, hahaha! Hi MM we were in Miniloc a few months ago and had lunch at that same Beach! Though it was just mé and my husband the food was abundant and glorious. We also had the grilled seafood, bbqued Meat, tuna ceviche (instead of shrimps), veggies and a lot more! Fantastic!! thank you, Mr MM, for this post – we’ll be having foreign guests soon and we are bringing them here. Am sure your guests enjoyed it. what a wonderful host you were to the teens friends MM. I am sure they enjoyed the trip to the Philippines and were happy to be away from the cold weather in the Northeast! I’m sure that the Teen’s friends would be raving about how fabulous your family’s hospitality was and how beautiful our beaches are. Rather curious how the Teen became friends with those guests in the first place if they haven’t been to the Phils yet. Are they random chat friends on the internet or people she’s met on one of your many holidays in the US. So trusting of their parents to allow their kids to wander off to such a far place. Ooooh. I love this!!! 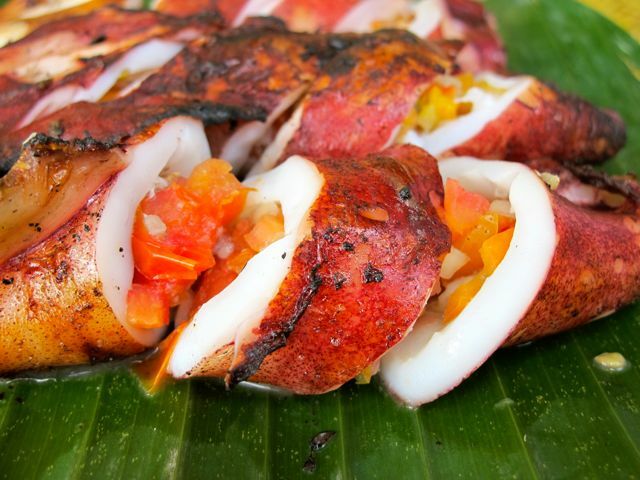 Better yet, can’t wait for you to share your experiments on that shrimp kinilaw. On a not-so-related note — I wonder if you’ve tried this experience I’ve read from one of the late Doreen Fernandez’s books. She was on a boat, on the waters of Iloilo, with some friends. With their bare hands, they would catch the still-alive jumping shrimps, immediately dip them in vinegar, and eat them. From the way I read this, this was ultimate freshness and deliciousness to the max. oh my!!! 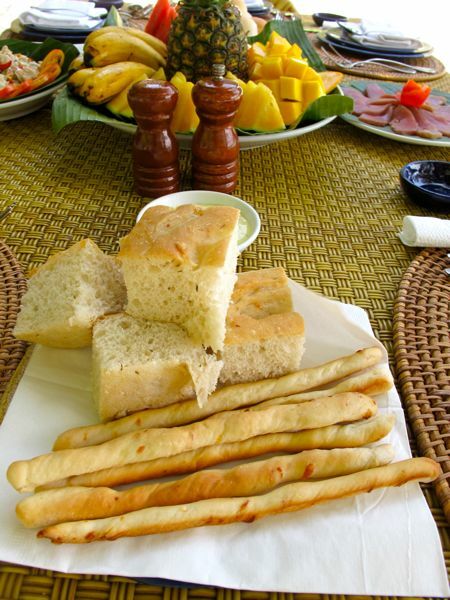 had flashbacks really of our lunch at Entalula Beach… and although our lunch was not as grand as your picnic lunch is, it was really a delicious one. 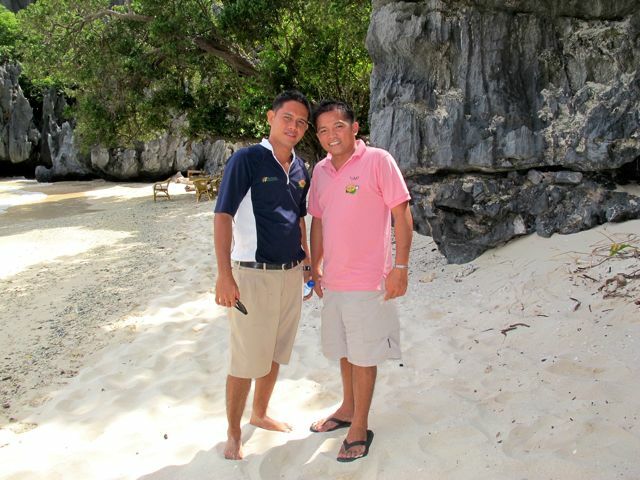 The staff really at El Nido Resorts are the best! still praying to be able to get to the beach sometime soon with my kids.. thank you so much for sharing the beautiful photos of the sea and the white sand MM. It’s the nearest I could get to the beach for now and i really appreciate the views.I’m sure babalik-balikan ko itong photos specially when city scenes get a bit too much. Sobrang ganda!! I truly wish more Filipinos can get to see these places. A piece of paradise. Thanks for sharing. yumyum is all can say on the food. it’s making me drool, so early in the morning here. wish i am there. really awesome setting,. may i know how much will be the cost for a setting like that? How long did you stay at Miniloc? Amazing. 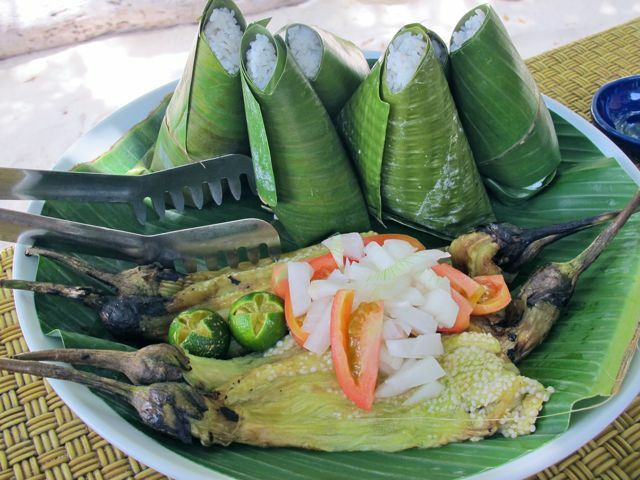 I know I will be vacationing there during the rainy season (June and July), but pictures like this keep me looking forward to fresh food – FRESH seafood and so much more. 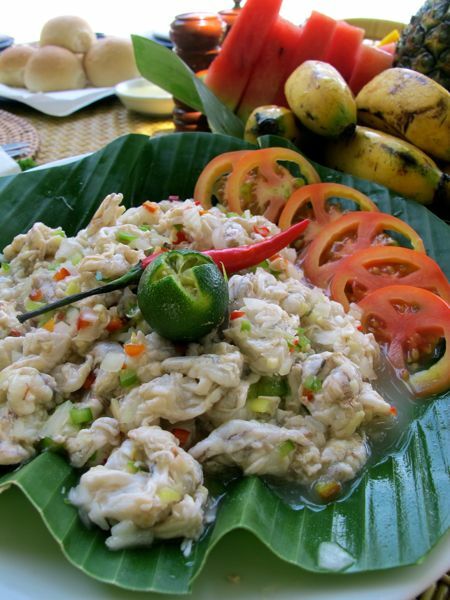 A great introduction to those that have never been to the Philippines for sure! chreylle and dogbone, they didn’t charge extra for the special lunch. 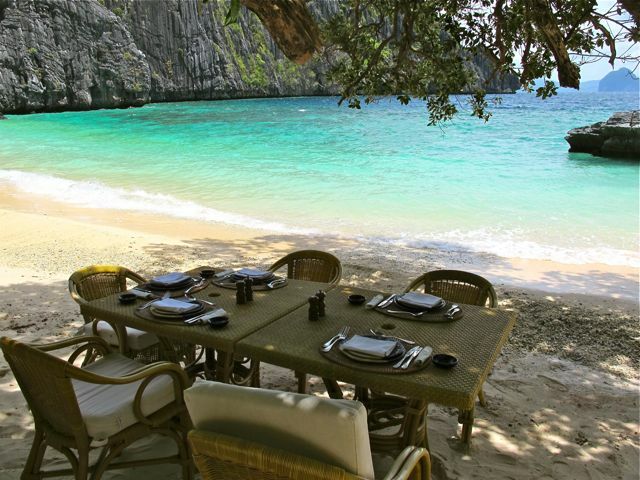 Rates at El Nido include meals… so this was simply in lieu of a lunch meal for us. Their website, here, is spectacular, and has more details. To give you a short answer, rooms would start at roughly $400 per night for two people, including meals. Flights are extra. Pricey, but worth it, in my opinion. I’ve been wanting to go to Miniloc for many, many years. 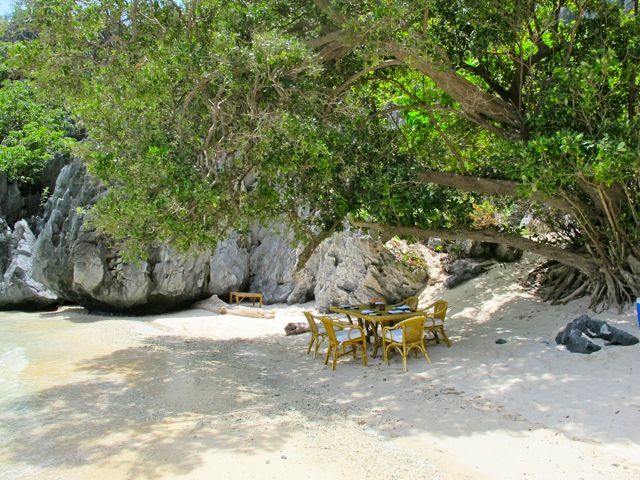 I know that there are cheaper resorts in Palawan, or even in El Nido, but I feel like when I go, I want to do it right. I really hope I can, while it’s still as good as it is now. wow! eating this fabulous meal with an amazing view, it’s heaven on earth! 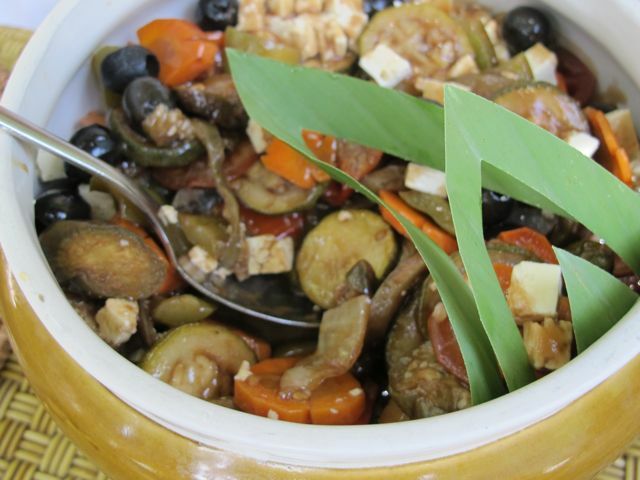 the shrimp kinilaw is mouth-watering–this is how we make kinilaw at home [in Negros]. Oh, the shrimp ceviche! The last time we had this at ( a Makati resto ) was a big disappointment for the price of P495. Glad to know yours were fantastic. “To give you a short answer, rooms would start at roughly $400 per night for two people, including meals. Flights are extra. Pricey, but worth it, in my opinion.” —couldn’t agree more! MM, THANK YOU for sharing this! I’m running out of ideas on what to do when we’re in the Philippines and since we’ll be going there with some friends from NL this year, this is an excellent experience for one of our weekends. What a wonderful and accomodating resort! Superb service too! there are some things you really cant do at home. you just have to outsource it! Thanks for sharing this wonderful experience, MM! How I wish I can go to Miniloc, too! The view alone is priceless! The food looks sumptuous too! Thanks for sharing! if those weren’t the best looking seafood feast, and gorgeous scenery i’ve seen, i don’t know what! glad you all had a blast! I missed the password posts. Too bad.